Preheat your oven to 170 degrees. Lay a sheet of parchment paper on top of a cookie sheet and place it on a counter. 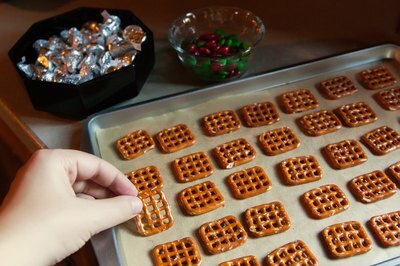 Place pretzels on cookie sheet in evenly spaced rows about one inch apart, keeping in mind that one pretzel will be used for each treat. Open and unwrap a bag of Hershey’s Kisses or Hugs and place them in a small bowl. Set one Kiss or Hug on top of each pretzel. 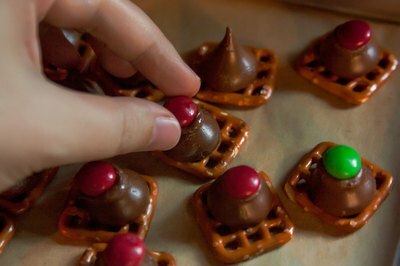 Place cookie sheet with pretzels and Hershey’s candies in the oven and bake for four to six minutes or until the chocolates feel soft when gently touched with a small wooden spoon. 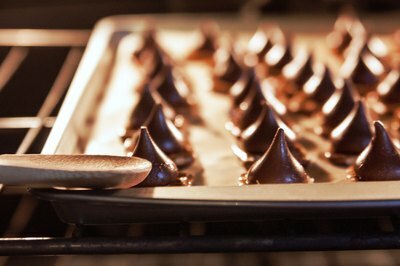 Remove the sheet from the oven and slide the parchment paper, with treats on them, onto a countertop. Quickly press one M&M candy into the center of each Hug or Kiss. Allow treats to cool on the counter until completely firm. If you want the treats to cool faster, set them in the refrigerator for 10 minutes after pressing M&M's into the Hershey’s candies. The History of "Rudolph the Red-Nosed Reindeer"